At the heart of the four-and-a-half-story-high particle detector of the CMS experiment at CERN is a collection of millions of tiny silicon devices known collectively as the pixel detector. When the LHC restarts after a planned shutdown from the end of 2016 to the middle of 2017, it will feature a brand-new pixel detector designed and built by a team at Fermilab in collaboration with 19 U.S. universities and more abroad. The new detector is part of an upgrade plan that, after a successful review at the end of August, is slated to receive the Department of Energy’s second stage of approval. Known as Critical Decision-1, the review covered the overall scale of the cost and schedule of the construction. The pixel detector is the particle detection system closest to the collision point. It measures the position of particles as they make their way through the detector with a precision better than one-tenth the size of a human hair . This helps scientists distinguish bottom quarks—which are produced, for example, in the decay of a Higgs boson—from other types of quarks. The new pixel detector design ensures that the detector functions well when the upgraded LHC produces a much higher rate of proton-proton collisions. Its support structure will be built out of carbon fiber, a much lighter, less dense material than the current pixel detector’s aluminum. This means particles are less likely to hit one of the atoms that make up the detector, thus helping reduce the number of extraneous particles generated when particles coming from a collision do hit atoms in the detector material. The CMS team also must update the readout electronics to cope with the higher collision and data rates that will arise from a more intense beam. 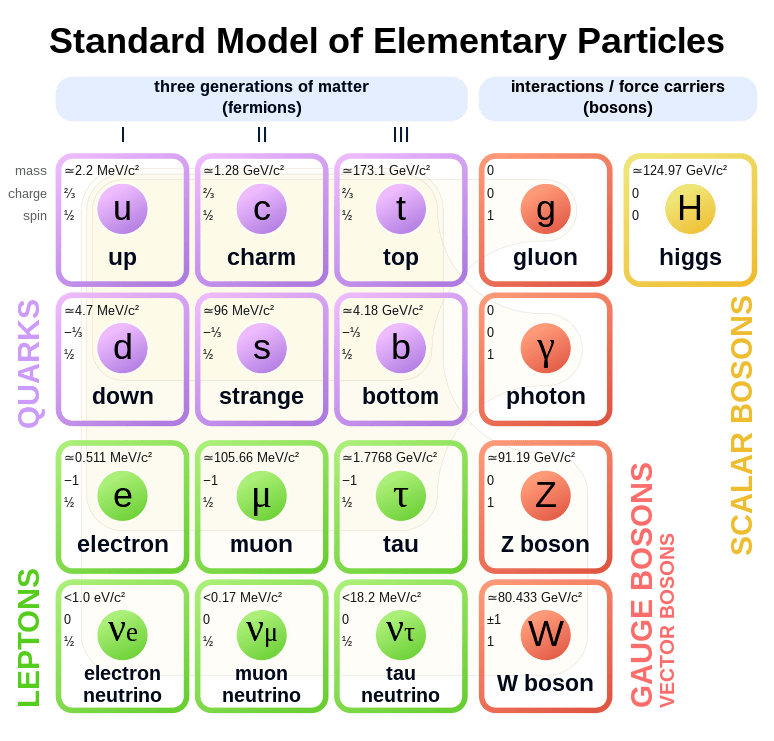 Fermions and bosons. Mesons and baryons. Electrons and protons. Researchers of the subatomic world must know the identity and understand the behavior of dozens of different kinds of particles. However, not all particles are equal. While all are interesting in their own ways, certain ones have a more widespread utility. One such particle is the muon. The muon is a cousin of the electron. Like the electron, it has a negative charge and an antimatter partner with positive charge. However the muon is much heavier than the electron—more than 200 times heavier than its svelte cousin. Also, the muon is less stable, living for two millionths of a second before decaying into an electron and two neutrinos. That lifetime seems very short, but for muons traveling near the speed of light, this is long enough for them to travel hundreds of feet or even more. This means that they live long enough to hit a detector. While many types of post-collision particles hit a detector, interact with the atoms inside it and are absorbed, muons have a special property. Because they do not experience the strong nuclear force, muons slip by most atomic nuclei unimpeded. And because they are very heavy, they don’t easily emit photons. Thus muons can pass through a great deal of matter without stopping. Scientists exploit this behavior of muons to their advantage. Essentially, it makes them easy to identify. Because muons are often created in interesting collisions, they are one of the ideal particles to isolate to study all sorts of fascinating bits of physics, including, for example, the discovery of the Higgs boson. The importance of the muon is made even more evident when you recall what the CMS acronym stands for: Compact Muon Solenoid. Understanding the performance of your detector is critical in making important physics measurements. 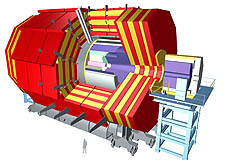 The muon detection system (shown in yellow and red) has been studied in great detail, resulting in a paper of more than 100 pages in length. See the full article about muons and CMS here. Kevin Burkett, deputy head of the CMS Center, wrote this column. “With the LHC at CERN now in the middle of a shutdown that will last until 2015, members of the CMS collaboration are hard at work on many different fronts: analyzing 2012 data, working on detector components for this shutdown and writing up the Snowmass study on the physics of the high-luminosity LHC. The rapid pace of our work means working simultaneously on the past, present and future. CMS scientists continue to harvest physics results from the LHC Run I data. One example is the recently discovered rare particle decay Bs→μμ. This result, which the CMS collaboration published simultaneously with the scientists working on the LHCb experiment, marks the culmination of more than two decades’ work from multiple collaborations in pursuit of this extremely rare process. Looking toward the future, two phases of upgrades are planned for the CMS detector. 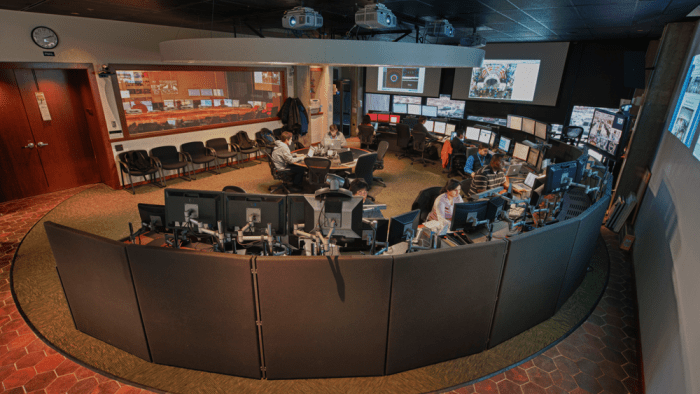 Fermilab personnel are key members of the teams that will implement the first phase of upgrades to the hadron calorimeter, forward pixel tracker and the trigger system after LHC Run II. The implementation of these upgrades should be completed by 2018. R&D is in progress for a second phase of upgrades to operate in the high-luminosity LHC (HL-LHC). We expect to complete those upgrades around 2023. With improved detectors and accelerators, the HL-LHC aims to deliver data samples over 100 times larger than what was recorded during the past run, colliding protons at the LHC design energy of 14 TeV. 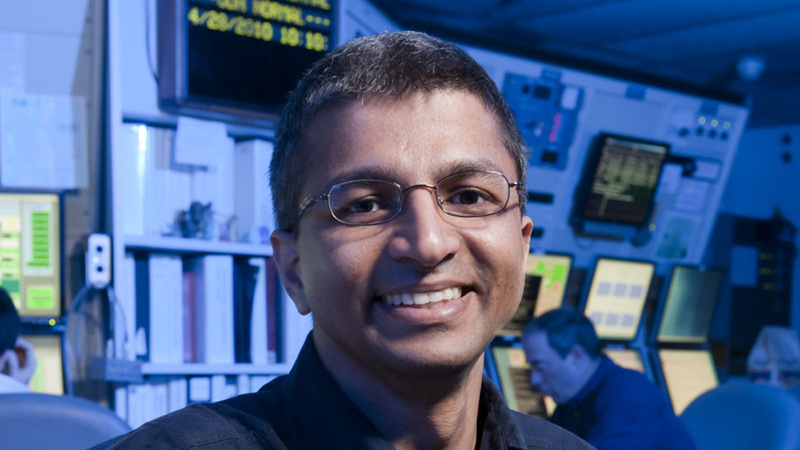 “Over the years, we have heard of the extraordinary scientific possibilities provided by the LHC’s very high energy. However, of equal value is its large number of collisions. When one is looking for a very rare and particular kind of collision, the best way to find it is to make many, many collisions. That increases the chances that a rare one will occur. One particle that is of special interest is called a Bs (pronounced “B sub s”) meson. This particle contains a bottom antiquark and a strange quark (or a bottom quark and a strange antiquark). While there are many ways in which it can decay, it is forbidden in the simplest calculations to decay into a pair of muons. In more complex calculations, however, it turns out that such a decay is possible, though exceedingly rare. Bs mesons are predicted by the Standard Model to decay into pairs of muons only once out of every 280 million decays. The first experimental evidence for this process was announced by the LHCb experiment in November 2012. Ordinarily such a rare decay would be of only academic interest, but there are many candidate theories for physics beyond the Standard Model that predict this unusual decay will occur far more often. These theories include several models that incorporate supersymmetry and another that involves hypothetical particles called leptoquarks. Because detecting two muons is very easy for the CMS experiment, it was natural for it to attempt such an analysis. While identifying muons is quite straightforward, the analysis was exceedingly challenging. Using all the data recorded in 2011 and 2012 (during which about 3 quadrillion collisions occurred in the detector, each containing tens, hundreds or even thousands of particles), only 30 or so decays of Bs mesons were identified as having the sought-after properties. “When the discovery of a new Higgs-like particle was announced last summer, it received a lot of well-deserved media attention. It is less widely known, however, that about a dozen new particles have been discovered in the past 10 years. Why all this lack of excitement? 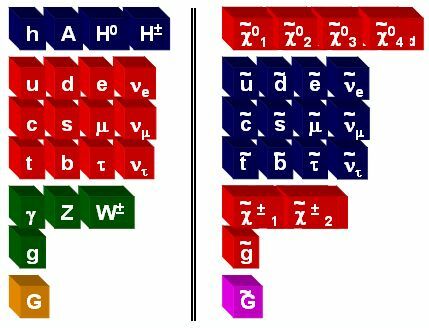 Unlike the Higgs boson, these other new particles are bound states of quarks: the same old particles in new combinations. But they should not be so quickly dismissed. These new particles may be made of quarks, but most of them defy conventional explanations of how quarks fit together. 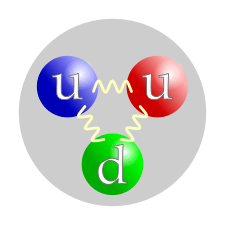 In the standard theory of quark interactions, quarks come in three types and can only bind together in ways that would result in an equal balance of these types. 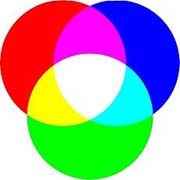 By analogy with the color wheel, they are called red, green and blue, and a particle like a proton is made of one red, one green and one blue quark, which mix to form white. Antiquarks are yellow, cyan and magenta. You can form a bound state from a yellow antiquark and a blue quark, for instance, since these colors are on opposite sides of the color wheel. See this Physics in a Nutshell for more. Up to 2003, the only combinations of quarks and antiquarks that had ever been seen were red-green-blue particles, yellow-cyan-magenta antiparticles, and quark-antiquark pairs. Since then, a growing number of bound states have been discovered that do not fit this scheme. The first of these, discovered by the Belle experiment in Japan, was the X(3872), named “X” because we do not know what it is, and “3872” for its mass, measured in units of MeV. The X(3872) and its companions might be the first examples of four-quark combinations, such as red-cyan-yellow-blue. These combinations are theoretically possible since they mix to form white, but they were not expected to be stable enough to be observed. The X(3872) in particular has a mass that is very close to the sum of two well-known bound states, D0 and D*0, so it might be a bound state of bound states. It has also been suggested that these new states are part-glueball hybrids. 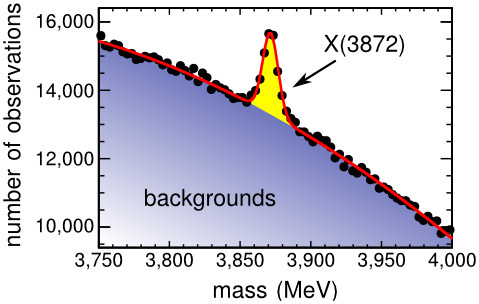 In a large sample of proton-proton collisions resulting in muons and pions, a few thousand of them accumulate above the backgrounds with a mass of 3,872 MeV. This is the X(3872). “The quarks and leptons of the Standard Model are assumed to be point-like. Note that this doesn’t require that they have no size; it merely means that if we make the simplifying assumption that they have zero size, then we can make predictions that are in good agreement with measurements. The history of fundamental physics is littered with the corpses of physics models of particles once thought to have zero size, from atoms to the protons and neutrons in atomic nuclei. Each of them eventually was shown to have a measurable size and consequently to be made of yet smaller particles. 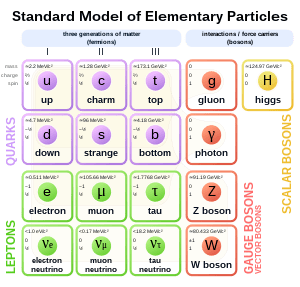 The Standard Model of elementary particles, with gauge bosons in the fourth column. For about 50 years, scientists have been poking at the quarks and leptons, trying to see if they are made of something smaller. However, the simple fact is that the success of the Standard Model has actually stymied our progress. “The Standard Model of particle physics is truly a triumph of scientific achievement. By combining 12 fundamental (i.e. structureless) particles and four forces, we can explain essentially every measurement that has investigated the nature and structure of matter. And, for most descriptions of nature, only four particles are needed. All of humanity can rightfully be proud of this accomplishment. Well!! Read on in the article for the excitement. The full article is here. Physicist Sam Hewamanage woke up, got ready and made his usual 15-minute drive to work. He parked his car, walked inside and sat at his workstation before digging into his primary task for the day: monitoring a particle detector located 100 meters underground on the border of Switzerland and France. Hewamanage (pictured below) doesn’t live in Europe. He lives in Batavia, Ill., just outside of Chicago. But he can work on the CMS experiment at the Large Hadron Collider as if he were on the CERN campus, thanks to the Remote Operations Center at Fermilab. 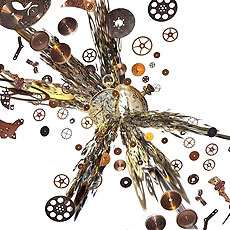 “It is sometimes said that if particle physicists wanted to figure out how an expensive Swiss watch works, they would smash it and deduce its structure from the cogs, springs and glass that fly apart. To understand the inner life of protons, this is exactly what they do—smash two of them together and analyze the aftermath. It is not as ridiculous as it sounds. The basic laws of energy and momentum conservation make a precision science of this violent practice. Energy and momentum are both quantities that describe the inertia of an object or a system of particles. Energy is the sum of motion in all directions, while momentum is the net motion, depending on direction. 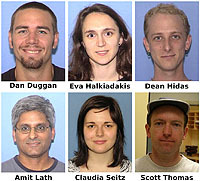 The Rutgers physicists pictured above were all major contributors to this analysis. “Supersymmetry, the notion that matter and forces are two sides of the same coin, is an elegant idea that could explain many of the mysteries of particle physics. Searching for it, however, is not an easy task because there are so many different ways it could manifest itself. How would you search for something that could look like anything? Fortunately, models of broken supersymmetry share a few broad features. For one thing, all of the models predict new particles, the superpartners of the ones we know. These would decay into familiar particles because they maintain part of their identity as they decay— for instance, supersymmetric quarks, called squarks, would decay to quarks. In many models, the lightest supersymmetric particle is invisible, like dark matter, which shows up in a particle collision as an apparent imbalance in the particle debris. In a recent paper, CMS scientists used these as criteria in a broad search for new physics. They looked for an excess of collision events with many high-energy particles in a lopsided pattern, as though an invisible particle carried away much of the energy. They found nothing new— all was in agreement with known physics.